Darden Restaurants owns and operates more than 1,500 restaurants -- including Olive Garden, Longhorn Steakhouse, Bahama Breeze, Seasons 52, and The Capital Grille. Through these restaurants, Darden employs more than 150,000 people and serves more than 320 million meals a year, and is the #1 casual-dining operator in terms of revenue. As a leading food provider, Darden has a unique opportunity and responsibility to use its considerable purchasing power to support a healthier, fairer, and more sustainable food system—in short, a greener diet! 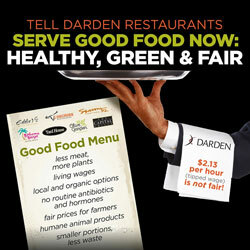 Join us and our allies Center for Biological Diversity, Friends of the Earth, Food Chain Workers Alliance, Food Democracy Now and Restaurant Opportunities Centers United, to call on Darden to serve greener meals that are better for our health, the planet, and the workers!